For numbers 1-5 in Part 1, please go here. 6. Make Peach Jam. No secret family recipe here. We like the recipe found inside the box of Sure-Jell boxed pectin. They have a number of varieties including regular, all-natural, low-sugar and no-sugar. I generally use the all-natural and low-sugar options. I don't dice my peaches for jam very small. If you dice them finer or mash them with a potato masher, they won't raise to the top like these do. 7. Eat them fresh until the juice runs down your arm and chin like you did when you were a kid. Remember those days? What's wrong with us now that we've grown up? We need to let loose a little more. Start with some peaches. Don't forget to slurp. The kids will love it. Freeze them chopped for baked goods like baked oatmeal. No sugar or special ingredients required. Just chop them and freeze them in the desired amounts (we do 2 cup bags) and toss them in the freezer. To use, thaw them and use them shortly after. 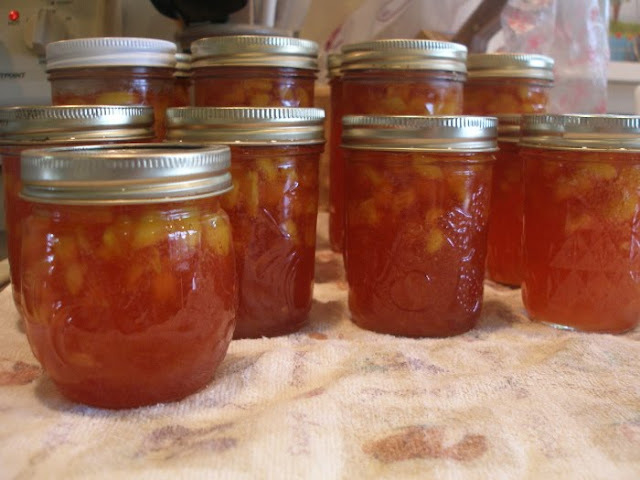 Canning peaches is fairly simple. But before you begin, PLEASE read this post on the basics of canning. Choose fresh, ripe peaches. Peel them, remove the pits and quarter them (You can pack more peaches in each jar if you quarter versus halve them). Place them in hot, clean, sterilized quart jars pit-side down, using a long handled spoon to turn them over if they fall wrong side down. Tap the jars on a folded dish towel (on the counter) to help the peaches settle so you can pack more in your jars. It takes about 4 1/4 peaches to fill a quart jar. 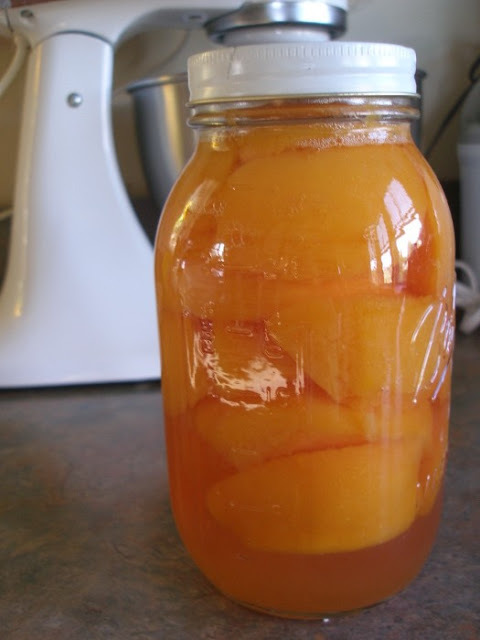 Pour a hot, sugar-water syrup over the peaches, using a table knife to help release any pockets of air left in the jars. Fill the syrup to just below the bottom of the ring thread at the top of the jars. The peaches should not come up above the bottom of the threads either. **If your jars are too full, they will bubble over in your canner and little peach pieces and residue will come between the jar lids and the rim, keeping the lids from sealing. 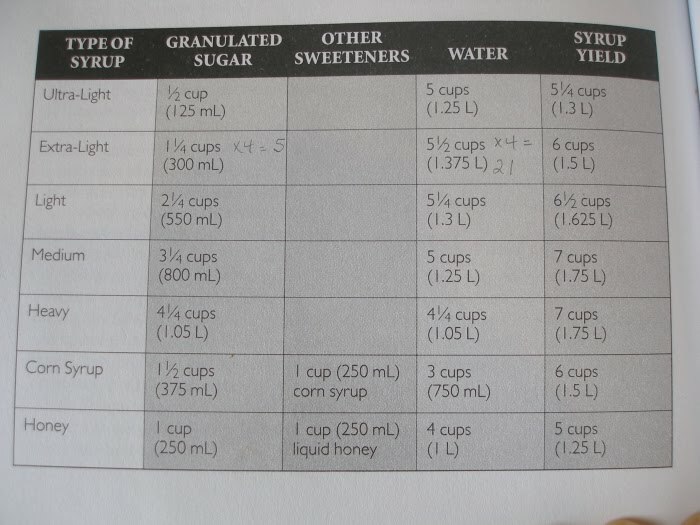 You have choices as to how sweet you want your syrup. We use the Extra-Light version. See the chart below. Each batch of syrup recipe is enough for about 4 quarts of peaches. Please ignore my pencil markings. This is from my Ball Complete Book of Home Preserving . After cleaning the tops of the jars, lidding them with hot lids and ringing them finger-tip tight, place them in a hot water bath of boiling water for 30 minutes. 9. Share the wealth (of peels, that is). 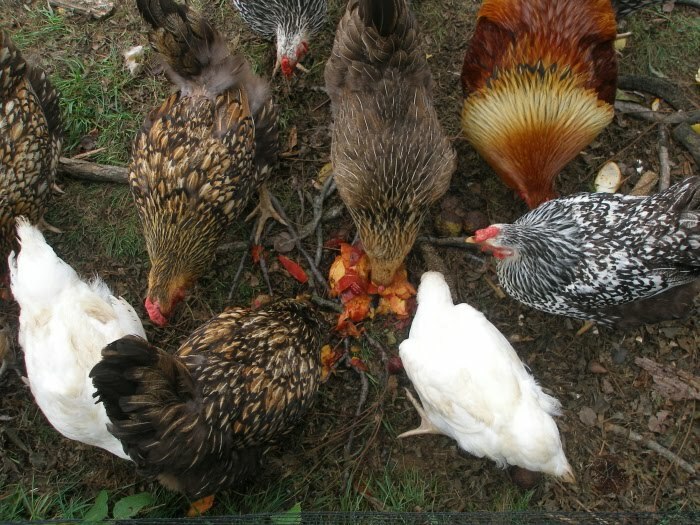 I love the final picture of the chickens with the peels. Him hoping to get some next spring to share mine with! Thanks for another awesome post. Love your blog. I make my jams the same way...I don't chop the fruit too fine and then I have some chunks at the top. I like it that way, but my mom always seems bothered by it...like I'm not doing it 'right'. Oh well. We just got chicks last month. Today was the first I gave them peach peels. They went crazy. I love putting my garbage to good use! I am really looking forward to canning peaches. My friend and I did about 70 lbs last year together (go teamwork!) and we enjoyed them all winter. I thought I HAD to use light syrup for peaches, but next time I'm going to follow your lead and use extra-light. I got a good tip for bubbling jars - the metal knife can apparently bang into the sides and weaken the jars (I've had the unfortunate experience of jars breaking in the canner). To bubble jars without metal, use a wooden chopstick. I'm rather careless about bubbling jars, though, I must confess. Eating peaches out of hand is still our favorite "recipe!" Our favorite meat birds so far were the ones we got last year. They were called red roasters (although I don't think this is their breed name). They preferred foraging and therefore took a little while longer to come of harvesting age. They were a beautiful brown and came from a hatchery near my parent's. I hate to ask a possibly stupid question, but when you freeze the peaches do you blanch/peel them first before you chop them? Or are you simply chopping them and throwing them in the freezer? Mindi, It's not a stupid question! No blanching. Just peel, discard the pit, chop, put in freezer bags and freeze:-). i love your site. i just canned my first batch of peaches (my first canning ever!). you made it so easy. one question . . . will the peaches brown? i didn't think about putting lemon juice in it and you didn't mention that either. will this affect the look of my peaches? thanks! Anonymous, Hello, there! I don't treat my canned peaches with lemon juice and have had no problem with them browning except in the case where a peach has floated to the top and a portion of it is above the syrup. That (above) portion of the peach often browns a bit, but we still eat it- it doesn't taste any different:-). Congratulations on the start of your canning career!! Thank you for your blog! I have one question about canning peaches since I've never canned or worked with peaches. How many quarts do usually get from a peck of peaches? I'm trying to figure out how many peaches I need.